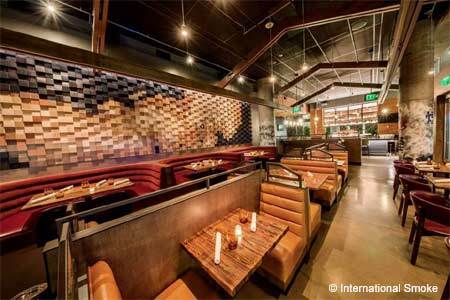 Hakkasan expands its global empire to San Francisco. 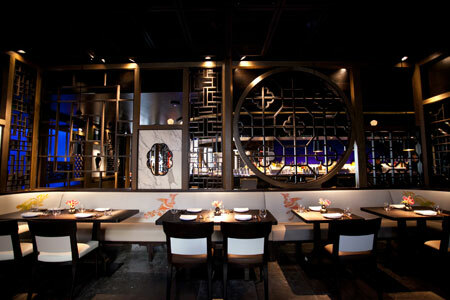 : Hakkasan’s 10,000-square-foot San Francisco outpost (there are also locations in London, the Middle East and beyond) employs cut-out and shoji-screen-style panels to opulently emphasize its spaciousness. A large horseshoe-shaped, sapphire-blue glass and stainless steel bar stands as an interior nightclub oasis, with seating equivalent to a small eatery. The extensive menu --- vegetarian, meat and seafood dishes, rice and soup --- includes updated gastronomic takes on Chinese dishes. Duck is an optimal choice; crispy duck salad is a satisfying lunch or an appetizer to share. Black truffle roasted duck in a delicate broth with truffle shavings floating lily pad-like across the surface offers tender meat and crispy skin aplenty. A wide range of sakés, wines and dessert wines by the glass is available, and if a cocktail is in order, try the signature Hakka, a pleasing punch of coconut, lychee and passion fruit. Desserts are more artful and varied than what one typically encounters in a Chinese restaurant. Private rooms seat a dozen or two and feature the largest Lazy Susans in the city.